Sweet cinnamon spiced apples with a crunchy cookie base and a buttery crumble topping! 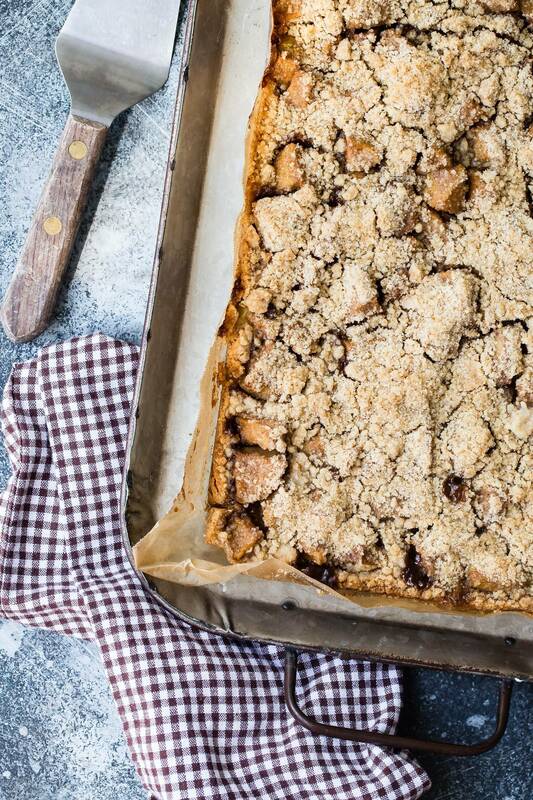 My apple pie bars are a great fall dessert, just don’t forget the ice cream! I was torn on what to post next for everyone, but I went with the recipe I was most excited about and that means I can’t wait to share it with you guys! Apple pie is one of the most popular desserts around fall, and it’s obvious why. Buttery pastry filled with warm chunks of fall-spiced apples is enough to make you want to curl up on the couch with some hot tea and a huge slice. But we can’t all just fade on the couch whenever the feeling hits us, does that mean no pie though? 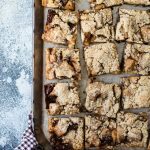 Heck no, these tiny apple pie bars are an awesome replacement for when we’re on the go and just want a quick taste. 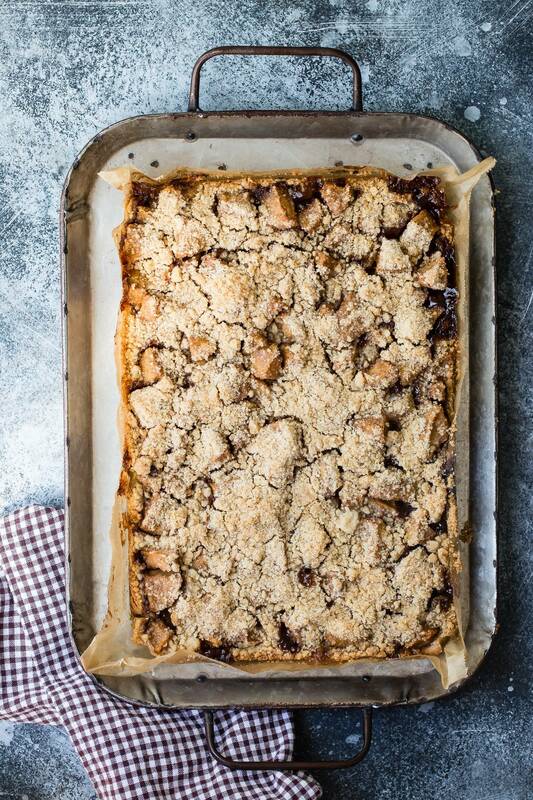 How easy are apple pie bars to make? They’re super easy and you probably have all of the ingredients in your kitchen. The recipe almost follows the same method as for how to make an apple pie. First, you’ll need to make the filling and we’re making it homemade so that we have more apple than liquid unlike some of the premade fillings you can buy. You can make the filling a day ahead so it’s ready just to dump into the pan on top of the pastry. Best apples to use for apple pie bars? I’d recommend Granny Smith’s. They’re solid and can stand up to a long time baking without turning soft. They also taste a little bit tart making them a great balance against the sweet brown sugar and cinnamon. Make sure to peel your apples or you’ll get bites of apple that seems chewy and hard to separate. It’s a pain and nobody needs to be chewing on apple peel. How do I make the crumble topping? In my experience, I always prefer to use my fingers to crumble the flour and the butter together. It takes a little longer and can become a tiny bit messy but I get a better feel for when the crumble is ready. Oats or chopped nuts can be added but I like the simpler way that I remember my mom using. Just butter, sugar and flour. First, you’ll need to bake the buttery shortbread base. You won’t bake it all the way so don’t be alarmed when it still looks raw in the center. It’ll finish baking when the filling gets added. The base would never bake all the way through if you added the apples to a raw dough for the base. By increasing the oven temperature on the second bake, you’ll be making sure that the crumble topping becomes brown and crunchy and not still doughy or soft. 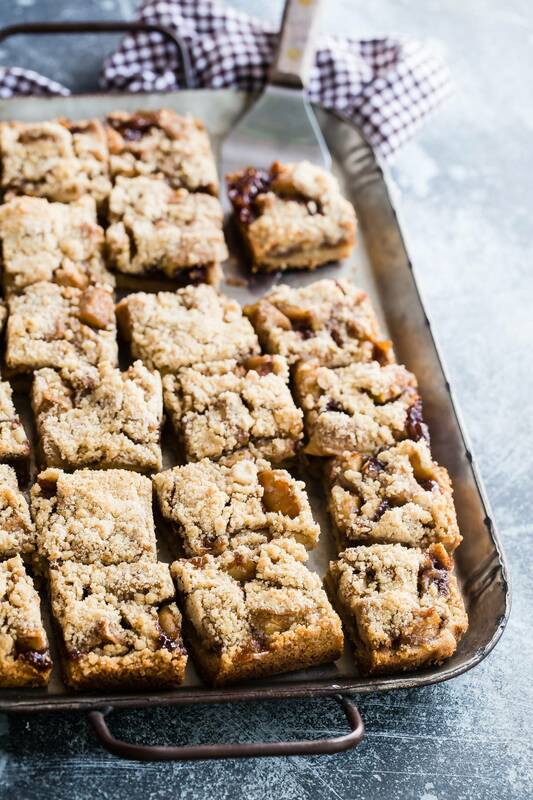 I sliced my apple pie bars into small pieces, just enough for two bites but if you’d rather keep them brownie size, totally your call. Serve them as is at room temperature or slightly warm which ultimately means you can add a scoop of some really good vanilla ice cream on the side for some extra indulgence! Apple pie (bars) and ice cream, yes! Sweet chunks of apple cooked in a buttery brown sugar and cinnamon sauce and then baked with a crunchy crumble topping. If you don't want to tackle pie making this fall, this is your next best dessert! Line a 13x9 inch pan with parchment paper and set aside. Slice the apples into chunks about an inch square and add to a large enough pan at least 10 inches. Add the butter, brown sugar, cinnamon, allspice and cornstarch and stir to combine over a low0medium heat. Once the sauce in the apples has started to bubble around the edges take it off the heat and set aside. To make the base, In a stand mixer, beat the butter, brown sugar and regular sugar until creamy. Add the flour and mix on slow speed until a dough is formed. Transfer the dough to your prepared pan and using your fingers and the palm of your hand spread the dough out so that the pan base is covered. Bake in the oven for 15 minutes then let cool for 5 minutes. Raise the oven temperature to 400 degrees. In a small bowl combine the brown sugar, butter, and flour and crumble together with your fingers until it feels like crumbs. Transfer the apple filling and any sauce onto the top of the pre-cooked base. Spread the filling out to cover the base being careful not to tear the dough. Sprinkle the crumble topping over the apples making sure to evenly cover them. Bake in the oven for about 30-35 minutes and the crumble looks golden brown on top. Let cool and slice into the desired size. Would you clarify the amount of butter in the base? Is it 8 ounces or tablespoons? Thanks! I’m looking forward to trying this recipe this week! Happy to see you used Granny Smith; perfect for autumn days to enjoy 1 Thank you ! 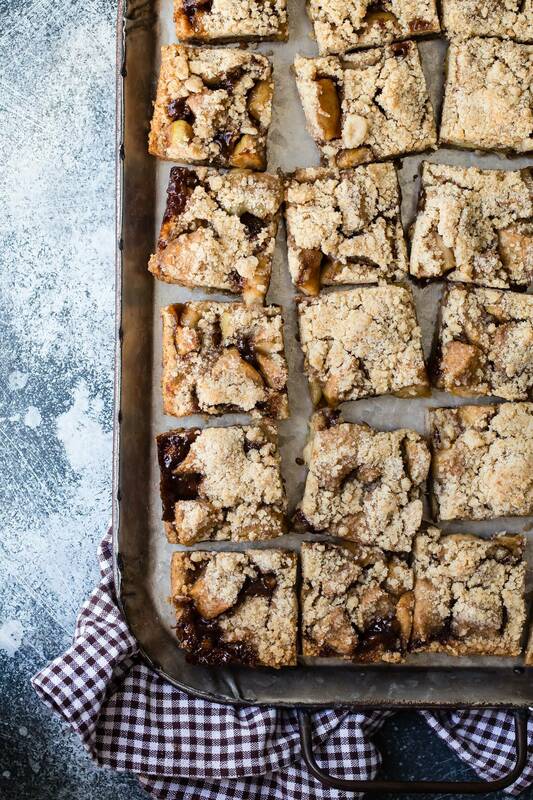 These apple pie bars are *literally* a fall dream come true! 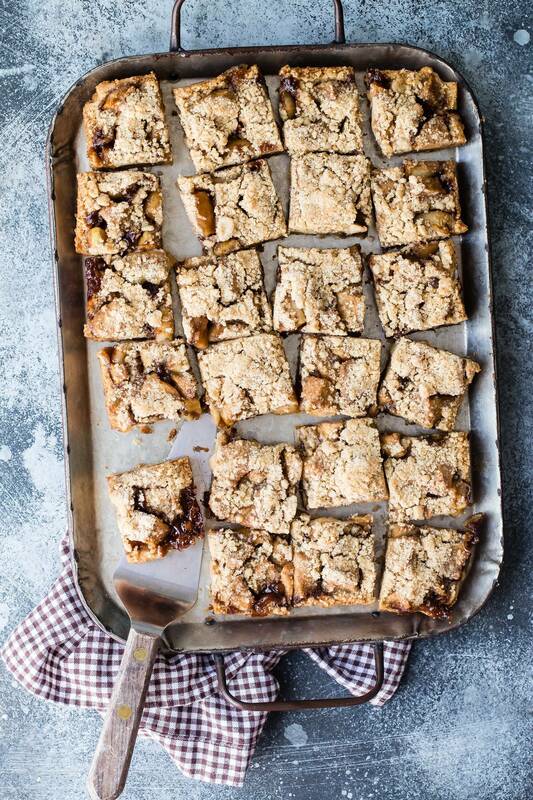 Apple pie bars are the best, these look dreamy!